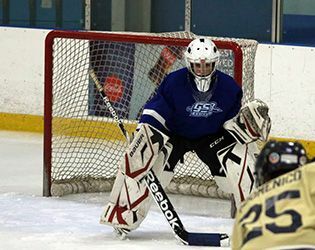 Last night, second-seeded Middle School ice hockey outscored third-seeded Randolph 8-4 to advance to the league championship finals. After putting up four goals in the first period, the team never looked back. Throughout the night, goals came from throughout the offensive lineup, with Brenen Lavoie '21 contributing three, Lucas Robins '23 and Connor Udoff '21 chipping in two apiece, and Ryan Getzoff '23 adding another. Assists came from Liam Jones '21, Lavoie and Robins. On defense, Matt Cooper '21 was spectacular, making 21 saves. After the matchup, head coach Pete Roslund said, "From puck drop to final buzzer, the team played a very solid game. Our defense swarmed the opponent, limiting their quality chances, and the offense netted eight goals on 25 shots." The team will take on top-seeded Chester Mendham in the championship finals on Friday. Roslund expects a tightly-contested, exciting matchup. The game will begin at 6:00 p.m. at Aspen Ice in Randolph, New Jersey. Congratulations to our Middle School hockey players on a terrific inaugural season and best of luck in the championship game!